CMO50 nominations deadline extended to absolute last deadline of 16 August, don't miss out! CMO50 annual program shines a light on Australia's most innovative and effective marketers. CMO has officially extended the nominations deadline for this year’s CMO50 until midnight on Wednesday 16 August. Now in its third year, the CMO50 is a highly successful, prestigious annual list that recognises Australia’s 50 most innovative Chief Marketing Officers driving business impact within their organisation. This year’s list is brought to you by our exclusive sponsor partner, Adobe. The CMO50 is about recognising those taking a leading role in fostering innovation and new ways of thinking not just within marketing but also their wider company, as well as demonstrating commercial acumen and effectiveness. Our ultimate objective is to shine a spotlight on the increased importance of Australian marketing leaders in business, as well as the role of modern CMOs in crafting future business growth and opportunity, and the skills needed to be successful. To be considered, marketing leaders must submit one completed nominations questionnaire. This can be completed by either the marketing leader, or their team on their behalf. Only one nomination per individual will be considered. Please note these questionnaires are shared with judges but kept in confidence. We must have nominations by midnight on Wednesday 16 August in order for marketers to be considered for the 2017 list. You can find the nomination form in online as well as downloadable format at here. 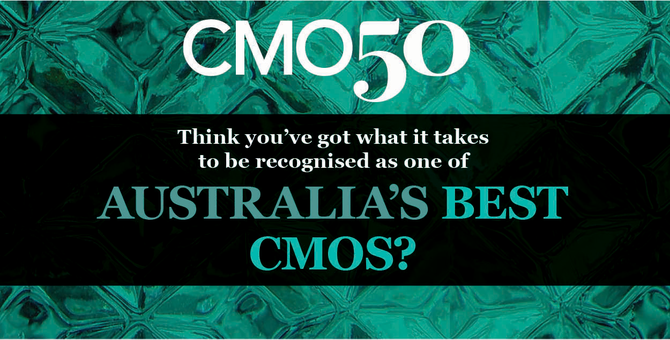 The CMO50 is only open to the top Australia-based marketer within an organisation with responsibility for the vision and strategy of the whole company marketing function. All nominations will be reviewed by our CMO50 judging panel, who will rate each section of the questionnaire in order to come up with our final list. This year’s CMO50 list will be revealed in October. The deadline for submitting nominations is so close, so get your entries in! Don’t miss this opportunity to shine as one of Australia’s marketing leaders and brands! This year, we’re also excited to confirm we’ll again be holding an exclusive evening event for the CMO50, featuring several of this year’s winners in profile. Attendance to this event is strictly limited to Australian marketing leaders. Stay tuned for further details.